The book is a historical overview of the Kaltjiti Arts Centre and the artwork produced there over the years. It traces the changes in indigenous culture through an exploration of song, dance and art. Diana, who is fluent in Pitjantjatjara, has spent many years working in the APY region and has developed strong bonds with the communities and people of these lands. The book is a result of these close relationships and an insight into their culture. Documents the artists' stories along with the development of Kaltjiti Arts from its humble beginnings in a primitive tin shed to a leading contemporary arts centre. 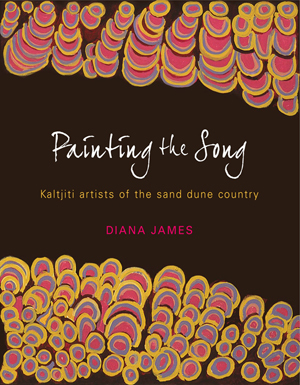 As well, James documents for the first time the modern history of batik, carving, weaving and painting in Pitjantjatjara and Yankunytjatjara lands. Includes the first publication of some rare 1940s photographs by anthropologist Charles Mountford and vignettes of 40 years of artistic development.